But they were undermined by a combination of their own unimaginative attacking and Brighton's disciplined defending. The last time these sides met in a league match, Swansea celebrated winning the League One title with a final-day victory over Brighton at the Seagulls' old Withdean ground in 2008. Since then, Brighton have moved to their plush new home of the Amex Stadium and both teams have risen to the heady heights of the Premier League. Brighton initially seemed to struggle with the step up as they lost three of their first five games, but just one defeat in the subsequent five suggested Chris Hughton's side had settled. And, though this is Swansea's seventh season in the Premier League, it was the Seagulls who played like the established top-flight side here. The visitors played at a sprightly pace, using their fair share of possession wisely and occupying the opposition defenders with the wily movement of Murray, Anthony Knockaert and Pascal Gross. Their goal was a case in point as Knockaert's whipped cross into the box was bizarrely left by Fernandez, presenting Murray with the simple task of guiding the ball in from close range. The rest of their display was built on defensive solidity, with a well-organised back four keeping Swansea's frequent but blunt second-half attacks at bay. It may only have been the first weekend in November but a sense of anxiety was already creeping in at the Liberty Stadium, where Swansea had lost four of their opening five league fixtures. Paul Clement's side had mustered just 20 shots on targets in their opening 10 league matches - and only Sunderland in 2012, Aston Villa in 2014 and Burnley in 2016 have registered fewer since these stats were first gathered in 2006. That figure remained unchanged after an uninspiring first half in which Swansea failed to create any clear scoring opportunities, and the nature of their performance drew boos from the home fans. There was some improvement after the interval as Nathan Dyer threaded the ball through to top-scorer Abraham, whose effort was smothered by Brighton goalkeeper Ryan. However, Swansea's attacks lacked invention and accuracy, with the delivery from their set-pieces particularly poor. And the atmosphere soured, with the home supporters turning their fury towards the club's owners and directors with chants of: "Get out of our club." The crowd's discontent echoed the disharmony of last season, which started with the American takeover of the club and saw Swansea go through three different managers before only narrowly avoiding relegation. On this evidence, Clement's side look destined for a long and arduous struggle to preserve their Premier League status. Swansea City manager Paul Clement: "If we perform at that level, you can't expect to win a game. "I see a team low on confidence and I see a crowd frustrated but there is nobody more low and frustrated than me. The responsibility is down to me, the staff and the players. "We will continue to work hard. We need to find a way to work even harder. Time isn't running out as there are lots of games that need to be played so it's not a crisis but we need to start winning games. "We might have to win ugly in order to get some results." Brighton manager Chris Hughton: "We played very well. We knew it was going to be a tough game and we fought very hard for the win so I'm very pleased with what the boys produced. "The thing with Glenn (Murray) is, he has a very good record of putting the ball in the net, which is what you need, but what I really like about him is his work ethic. "He works hard on the training ground and then brings it to the pitch. But the boys all put a shift in today and I'm really pleased with the effort." Swansea have managed just one clean sheet in their six Premier League games at the Liberty Stadium this season. This is the first time Swansea have ever lost five of their first six home matches in the league. After failing to score in their first three Premier League games, Brighton have netted in seven of their past eight in the competition. Since the start of last season, Harry Kane (37) is the only English player to have scored more goals in the top two tiers of English football than Glenn Murray (27 - level with Tammy Abraham). There were just 15 shots in this match - only four Premier League games have seen fewer this season. Glenn Murray has scored in three successive Premier League games for the first time since April 2015. After the international break, Swansea travel to Turf Moor to take on in-form Burnley on Saturday, 18 November (15:00 GMT). 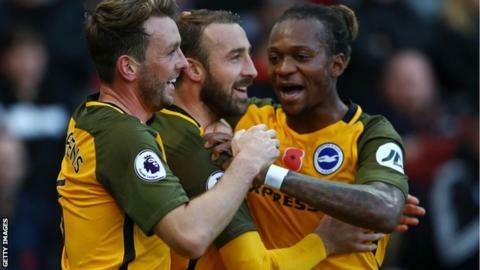 Brighton will look to make it five games unbeaten when they host Stoke City on Monday, 20 November. Match ends, Swansea City 0, Brighton and Hove Albion 1. Second Half ends, Swansea City 0, Brighton and Hove Albion 1. Foul by Lukasz Fabianski (Swansea City). Corner, Swansea City. Conceded by Lewis Dunk. Attempt blocked. Tammy Abraham (Swansea City) right footed shot from the centre of the box is blocked. Assisted by Federico Fernández with a cross. Corner, Swansea City. Conceded by Gaëtan Bong. Luciano Narsingh (Swansea City) hits the bar with a right footed shot from the centre of the box. Assisted by Tammy Abraham. Attempt saved. Oliver McBurnie (Swansea City) header from the centre of the box is saved in the top left corner. Assisted by Luciano Narsingh with a cross. Offside, Brighton and Hove Albion. Isaiah Brown tries a through ball, but Tomer Hemed is caught offside. Offside, Brighton and Hove Albion. Pascal Groß tries a through ball, but Anthony Knockaert is caught offside. Corner, Brighton and Hove Albion. Conceded by Alfie Mawson. Attempt missed. Alfie Mawson (Swansea City) header from the centre of the box is high and wide to the left. Assisted by Luciano Narsingh following a set piece situation. Luciano Narsingh (Swansea City) wins a free kick in the attacking half. Substitution, Swansea City. Wayne Routledge replaces Sam Clucas. Offside, Swansea City. Jordan Ayew tries a through ball, but Luciano Narsingh is caught offside. Sam Clucas (Swansea City) is shown the yellow card. Corner, Swansea City. Conceded by Shane Duffy. Substitution, Swansea City. Luciano Narsingh replaces Tom Carroll.